Through the past few years Mirror have gained a wide reputation for some of the most beautiful unearthy drone music. Mirror is usually regarded as a duo of Christoph Heeman and Andrew Chalk, but on various records they are assisted by Jim O'Rourke. Since late 2004, Vicky Jackman and Timo van Luyck have more or less joined the ranks. Their 'Viking Burial For A French Car' consists, partly, of a recording made by Mirror in Dundee, Scotland in October 2003, where Mirror was extended with David Keenan (author of 'England's Hidden Reverse'), Gavin Laird and Alex Neilson. The concert was an accompaniment to the film 'Haxan', about witchcraft through the ages. In an epic thirty-seven minute Mirror extends beyond the drone music and comes up with an orchestral piece, in an almost Xenakis style: building a large crescendo and in the middle an explosion afterwards the piece slowly follows it's course in descrescendo. A surprising piece for Mirror, that would not have worked on a LP release. It's length requirs an uninterrupted listening. 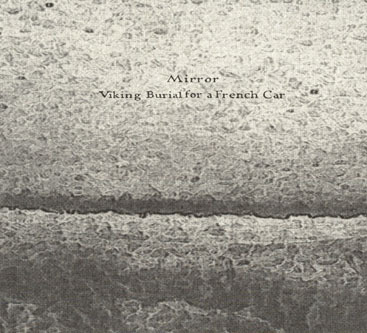 'Viking Burial For A French Car' is one of the rarer CD releases by Mirror, who usually release their work on LP, and will surely appeal to those with a limited music budget. Packed in the usual Plinkity Plonk sleeve. Design by Andrew Chalk. Das Label mit dem niedlichen Namen releast hier ein Stück (laaang) dass definitv eine Freude für jeden Minimalisten ist, denn es dreht und wendet sich mit wenigst Kraftaufwand, dafür aber cleverer Kleinstmodulation und das klingt, entgegen vielleicht manch anderer Dinge von ihnen, aber Mirror ist eh ständig im Fluss und man weiss nie ganz genau wer jetzt da nun eigentlich mitspielt, so gar nicht dronig, obwohl es dronig ist. Enstanden zu einem Film über Hexen zelebriert es eben einfach die Unheimlichkeit des Langsamen. One of the most atypical Mirror releases, this beautifully ethereal composition is also among the best works by Heemann and Chalk, here with the help of David Keenan, Gavin Laird and Alex Neilson during live segments recorded in Scotland in 2003. After a long silent introduction, a gaseous matter formed by superimposed loops and sparse, distant clatterings by percussives and guitar establishes its presence to stay throughout the piece, its pleasing malady spreading all over the place in a deep-laid plan to take over our consciousness. The flutey chimes of these repeating circles assume an appearance of tranquil demeanour at first, but slowly and incessantly transport their recipients in a semicontrolled state of proportionate magnification of the deeper self, something that Mirror lovers know extremely well by now. This is not territory for ombrophobous creatures, but the luminescence of this infrasonic revelation constitutes another message that's there to be comprehended. .... Damit nicht genug. Unter dem reichlich seltsamen Titel Viking Burial for a French Car (Plinkity Plonk Records, plink 18) habt MIRROR einen weiteren Dreamscape eingespielt, der teilweise auf einer Performance im Oktober 2003 im schottischen Dundee basiert. Chalk & Heemann spielten bei dieser Gelegenheit ,Film'-Musik zu Haxan, einer Dokumentation der Hexenverfolgung, und wurden dabei unterstützt von Gavin Laird, Alex Neilson & David Keenan, dem Autor von England's Hidden Reverse. Das Material wurde zu einer Dröhnwelle geformt, einem wie aus einem einzigen Orgelcluster anschwellenden Crescendo, in das sporadisch Gitarrenklänge und perkussives Hantieren, ein metallisches Klopfen und Knarren eingestreut sind. Diese wischenden Schläge, wie von einem eisernen Besen, und ein schepperndes Gestöber, ähnlich ominös wie bei verwandten Klang-'Bildern' von Organum, wirken als Spurenelement menschlicher Aktivität. Anonym zwar und schwer zu deuten. Ritzzeichnungen von unbekannter Handschrift, rituelles Geklapper unbekannter Absicht. Die Dröhnwolke über den Köpfen flaut nur ganz allmählich wieder ab, so wie die Sonne sinkt und im Untergang erst noch alle Nuancen von Abendrot als sublimes Decrescendo ausblutet. Unter dieser dröhnenden Hyperbel, die den Horizont überwölbt, hält jemand den Blick auf Nächstliegendes gerichtet, stöbert nach Brauchbarem, Werkzeug oder Waffe. Andrew Chalks Covergraphik zeigt nur amorphe, zementgraue Verlaufsformen, wie Schnitte durch Hirnmasse. Mirror wirft die Imagination auf sich selbst zurück wie ein Bild von Magritte, irritierend ver-rückt, verdoppelt, spiegelverkehrt. Mirror, the longstanding duo of founding HNAS member Christoph Heemann and noted British sound artist Andrew Chalk, is tough to parse. Not just because the group can expand to include friends like Jim O'Rourke or Andreas Martin, but because the type of diffuse, illumed, organic drone that the group trades in is usually only released on LP in beautiful hand-colored sleeves. And in absurdly small batches. Similar to the practice of Egyptian entombment, Viking burials often included valued and practical objects alongside of the corpse to accompany his or her voyage through the afterlife. Another interesting feature of the Scandinavian burial practice had to do with bodies being interred on boats, or if this proved unfeasible, their gravestones would be boat-shaped, granting the deceased with eternal marine passage. As with previous Mirror albums and Christophe Heemann's work in general, Viking Burial for a Dead French Car is an explicitly cinematic and visually-oriented listening experience. Opening, languorous horns eulogize in fanfare, blurred by coralline reverb. Eventually, percussive metallic textures interrupt and bloom into a subtle crescendo, and things revert back to the rich drones Heemann is known for. This is not to downplay the role of Andrew Chalk, who often seems to provide the long tones that constitute Mirror's primary sound; it's just that Heemann is, perhaps reluctantly, a consummate leader that seems to add focus and concept to the players around him. The music on this disc is yet another fascinating display of Heemann's ability to produce an illusion (or mirror) of slow-paced musical naturalism by stitching together disparate excerpts. Here, there are substantial chunks taken from a performance in Scotland, several years old, intended as a soundtrack for Benjamin Christensen's 1922 film Haxan: Witchcraft Through The Ages, a dark, faux-documentary made in Denmark. Yet, the music, as the title suggests, ultimately seems to come together with a different vision. While Mirror often takes a bare-bones starting point, and through disorienting, extended pitches distort time and structure, Viking Burial almost begins amidst an already strange and dense listening experience. This might have something to do with the epic, orchestral quality of the recording, described elsewhere as akin to some of Xenakis' particularly swarming and opaque work. Yet, the repeating and shifting horn motifs and shimmering chromaticism are very reminiscent of Morton Feldman's later orchestra pieces, and "Coptic Light" in particular seems to be a reference point. What's striking here about Mirror is their ability to constantly create an evolving depth and texture. While it is very cinematic, as mentioned above, it's also keenly spatial in a way that films very rarely, if ever, can invoke. Mirror, while not obsessed with the surprise tactics of precursors like Mimir and H.N.A.S., still seems to retain a sense of awareness of the meaning of their musical gestures, an ability to blur the obvious weight that a given instrument or sound holds. There is a constant purposeful intent with all of Mirror's projects and Viking Burial is an excellent example of this group at its most colorful.